Staff Selection Commission’s CGLE is one of the most coveted tests for graduates to secure a job in various central civil posts. In 2013, about 12 lakh candidates took the CGLE. This year, the exam is scheduled to be held on August 27. This mock tests will help you locate your weaknesses and understand how to maximise your overall score. Direction: In questions number 1 to 3, select the related words/ letters/ number from the given alternatives. 1. 76 : 42 : : 66 : ? 2. PARLEG : ALGPRE :: NATURE : ? 3. 36 : 114 :: 49 : ? Direction: In questions number 4 and 5 find the odd. Directions: Questions number 6 and 7, which set of letters when sequentially placed at the paper in the given letter series. 10. Which of the following interchange of signs would make the given equation correct? 14. Some statements are given followed by two conclusions I and II. You have to consider the statements to be true, even if they seem to be at variance from commonly known facts. You are to decide which of the given conclusions can definitely be drawn from the given statements. Indicate your answer. All files are papers. Some papers are books. I. All files are journals. 15. In a row, 25 trees are planted at equal distance from each other. The distance between Ist and 25th tree is 30 m. What is the distance between 3rd and 15th tree? Direction: (Q16-17) Find out the missing term. 16. DHK, GKN, JNQ, ? . 17. 46, 50,47, 55, 49, 61,? 18. Anand travels 10 kms from his home to the east to reach his school. Then he travels 5 kms to the south to reach his father’s shop, after school. He then travels 10 kms to the west to help his uncle. How far and in which direction is he from his home ? 19. At a birthday party, 5 friends are sitting in a row. ‘M’ is to the left of ‘O’ and to the right of ‘P’. ‘S’ is sitting to the right of T, but to the left of ‘P’. Who is sitting in the middle? Directions: Question No. 20, two statements is given followed by conclusions / inferences. You have to consider the statement to be true, even if it seems to be at variance from commonly known facts. You are to decide which of the given conclusions / inferences can definitely be drawn from the given statement. Indicate your answer. (I) Some students are intelligent. (II) Ankita is a student. 1. Some students are dull. 21. If H = 8 and HAT = 29, find how BOX = ? 22. From the answer figures, find out the figure which is the exact mirror image of the question figure, when the mirror is place on the line ‘MN’? 23. Which answer figure will complete the pattern in the question figure? 26. = a + b then the value of a and b. 33. A group of 18 men and 12 women can do a piece of work in 18 days. A woman takes twice as much time as a man to do the work. How many days will 8 men take to finish the same work ? 35. A 320 metre long train takes 80 seconds more to cross a platform twice its length than it takes to cross a pole at the same speed. What is the speed of the train in metre/second ? 38.The total area of a circle and a rectangle is equal to 1166 sq.cm. The diameter of the circle is 28 cms. What is the sum of the circumference of the circle and the perimeter of the rectangle if the length of the rectangle is 25 cm? 39. Two circles touch externally. The sum of their areas is 130cm2 and the distance between their centres is 14 cm. Find the radius of the larger circle. 40. The length of the side of a square is 14cm. Find out the ratio of the radii of the inscribed and circumscribed circle of the square. 41. In what time would a cistern be filled by three pipes whose diameters are 1cm, 1 cm and 2cm, running together, when the largest pipe alone can fill it in 61 minutes; given that the amount of water flowing in by each pipe being proportional to the square of its diameter? 42. In a bag there are coins of 5 paise, 10 paise and 25 paise in the ratio of 3 : 2 : 1. If there are all Rs 30, how many 5 paise coins are there? 43. Vivek is 30 years younger than his uncle today. 5 years ago, Vivek was th as old as his uncle. How old will Vivek’s uncle be 5 years from today? 44. Rs. 800 is divided among A, B and C so that Rs. 50 more than of A’s share, Rs. 20 more than of B’s share, Rs. 40 more than of C’s share are equal. What is B’s share? 48. On dividing a number by 13, we get 1 as remainder. If the quotient is divided by 5, we get 3 as a remainder. 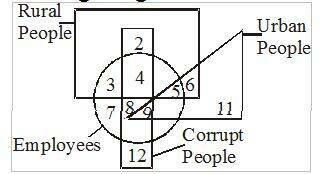 If this number is divided by 65, what will be the remainder? 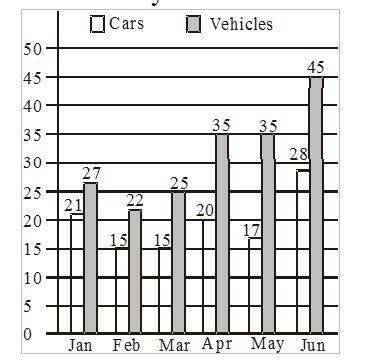 Direction:- (49-50) following bar diagram shows the registration of cars and total vehicles (in thousands) during first six months of the year 2013 in Delhi. 49. What was the increase in registration of vehicles other than cars from Jan to April 2013? 50. What was the percentage of increase in registration of cars from May to June 2013 ? 51. Which of the following is used to prevent soil erosion on hill slopes? 53. _____________are known as the “ecological hot spot of India”? 54. Which among the following countries are referred to as the ‘Golden Crescent’ the largest opium industry in the world? 56. The Mughal emperor___________was illiterate. 57. What is an emulsion? 59. ____________is also known as White Vitriol. 60. What is a formalised system of trading agreements among groups of countries is known as? 61. Whose writing influenced Mahatma Gandhi profoundly? 62. Which day is celebrated as the National Sports Day of India? 65. Which of the following does the Indian Standard Time relate to? 66. ____________is the excess of price an individual is willing to pay rather than forego the consumption of the commodity. 68. Which of the following is the star second nearest to the Earth after the Sun? 71. Which among the following isn’t an All India Service? 73. ___________is the unit for measurement of noise. 74. Who among the following defeated Arabs in 738 A. D.? 75. Who among the following founded Atmiya Sabha? Directions (Q.76 to 79): Read the following passage carefully and answer the questions given below it. In February this year, the government presented its new population policy with much fanfare. Although claiming to incorporate new and more effective incentives for population stabilization, a close examination of the policy reveals that it is more a “population discrimination” policy than an effective population management policy. Lacking in concrete measures, the crux of the policy rests on denying states representation to parliament based on their population. In other words – the essence of the population policy is that by taking away the democratic rights of those states whose population is growing too fast – i.e. the states in the Hindi belt – these states will somehow find a way of controlling their population. This is both naive and absurd – even as it is discriminatory and unethical under India’s constitution. The new population policy is but a sophisticated excuse for passing the buck – and for ensuring that nothing concrete is done. Rather than investigate why the Hindi-belt states have failed to control their population and what the centre could do to facilitate that process, the centre has taken to a cheap discriminatory formulation that essentially washes its hands off the problem – as if India as a whole will be unaffected by unsustainable population growth in the Hindi-belt states. 76. As per the passage, which of the following is true? Directions (Q.80 to 82): Out of the four alternatives choose the one which can be substituted for the given words / sentence. Directions (Q.83 to 85): Given below are sentences where blanks have to be filled with an appropriate word(s). Four alternatives are suggested for each question. Choose the correct alternative out of the four. 83. Hardly had the guests arrived ………….it started snowing. 84. As no conclusive evidence was there, the accused were acquitted ………..the charge. 85. President has ………… the death penalty of the convict. Directions (Q.86 to 89): Find out which part of the sentence has an error. If a sentence is free from error, mark “No error” as your answer. Directions:- (Q.90 to 92): Select the word in the following questions which is wrongly spelt. Directions: (Q.93 to 95): A part of the sentence is underlined. Below are given alternatives to the underlined part at (1), (2) and (3) which may improve the sentence. Choose the correct alternative. In case no improvement is needed your answer is (4). 93. Tell him that our leader has granted him the permission of stayin our country. 94. If I was you, I wouldn’t trust a miscreant like him. 95. We were amazed through performance in the competition.